Washington Evening Times, January 16, 1896, p. 4. Every winter, cold snaps and new snow fall brought the Lake under the watchful eye of eager ice skaters. As the ice continued to thicken, the Chevy Chase Land Company would turn on the lights around the lake announcing the winter season. Newspaper articles documented conditions of the ice, and reported on the crowds and the fun had by all. 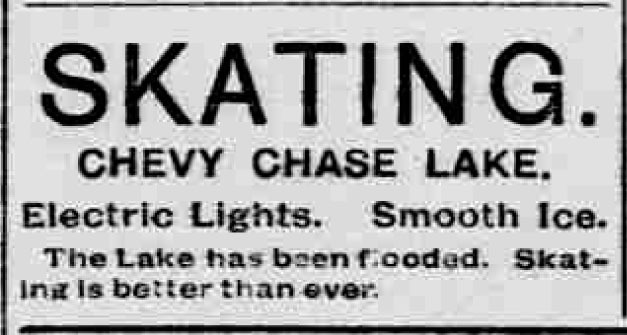 In one article from the early 1900s Chevy Chase Lake was considered an ice skating Mecca for skaters. Because the lake was not as big as the Tidal Basin, it was deemed safer, and provided a better, smoother surface for skaters. The solidity of the ice allowed for excellent skating conditions and as a result, hundreds of skaters would flock to the lake each night, staying until the last streetcar left to return to the city. Margaret Winkler Skating at Chevy Chase Lake, 1927. On the next page, listen to an oral history interview with George Winchester Stone, Jr. as he recalls skating on the lake.